For her latest novel The Wild Air, Rebecca Mascull spent months researching the history of female aviation. 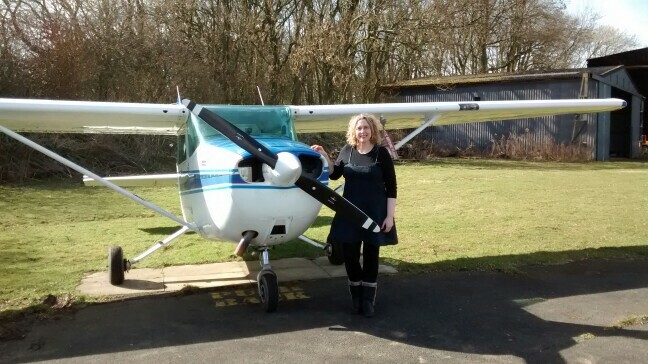 Here she discusses the position of women in an industry long dominated by men, and her own experience of flying in a light aircraft. In writing about an aviatrix, I intended to create the whole story through research and imagination, as writers are wont to do. Having met Rob Millinship early on in the research process, who told me that I really ought to go flying if I was going to write about it, I said Maybe . . . but never actually intended to go through with it, terrified as I was at the thought. I put it off and put it off for about eighteen months, until one sunny perfect Good Friday I thought, Oh stuff it, and went down to Leicester for my first flight in a light aircraft. Della’s first flight is entirely based on that experience and how glad I am now that I finally did it. I thought I knew about flight, because I’d read about it and interviewed pilots and watched videos. But I didn’t know about it, not really, not from the inside out. Only doing the damned thing can give you that. It was fear and freedom all at once and it was bloody marvellous. The Cessna plane in which Rob Millinship took me for my first ever flight in a light aircraft. In interviewing Diana Britten, a champion aerobatic aviatrix, I found that the position of women in aviation had in some ways improved since Della’s time, but I was surprised to find that in other ways little progress had been made. There are still relatively few women airline pilots. I was shocked to read of an interview with an airline pilot from only a couple of years ago who had passengers refuse to fly on her aircraft when they discovered their pilot was a woman. Della would be so disappointed to find that a hundred years of progress had come to this. I can only hope that young women are not put off by such stories and instead see them as a challenge to overcome. Let us hope that as time goes on, more and more women are encouraged to make the sky their home, as Della did. As my character Dud says, flight is preposterous. It just doesn’t really seem possible, when you think about it (especially bumble bees and jumbo jets). Today we are still learning about flight and, in particular, how birds and insects do it so effortlessly. To date in 2017, it was only recently that researchers finally proved exactly why and how migratory birds fly in V formations. It’s all to do with upwash and how each bird’s position in a V maximises lift. Birds worked this out themselves, the clever things, whereas we had to think our way into the air, as Auntie Betty tells Della. I take my hat off to those early pioneers of flight, both women and men, many of whom diced with death to drive flight forwards, and many of whom died trying. As war overtook aviation, many pilots from different nations became guinea pigs in the rapid development of aircraft and paid for this with their lives. Throughout the history of aviation, from gliders to space shuttles, many women and men have died in our pursuit of this glorious dance with the wind. The Wild Air is a celebration of their bravery and spirit.